Menthol and mint flavoured E Liquids are the go-to option for those who are transferring off menthol tobacco products. Steam age vape shop has hand-picked a fine selection of menthol and mint flavoured E Juices to help you on your way. Choose from our selection of High PG, High VG & nic salts menthol blends: Cool crisp menthol, tobacco & menthol blends, extra strength menthol, sweet peppermint, fruit menthols & spearmints. Whichever you choose today, please enjoy the experience and congratulate yourself on trying something new ... or sticking with something that works for you. Menthol E Liquids There are 36 products. 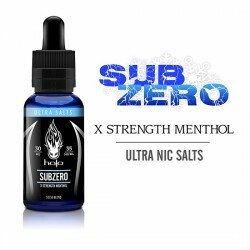 Halo SubZero - High VG Blend (70%) Extra Strength Menthol It doesn’t get any more menthol than SubZero. With three times the cool mint effect. 70% VG blend, optimised for sub-ohm vaping. Halo Kringle's Curse E-Liquid Sweet Peppermint A rich burst of peppermint in every delicious puff. eVo Spearmint E Liquid High PG: 50% PG/ 50% VG blend. Breath mints have met their match. Spearmint — a refreshing new e-liquid twist on an old favourite — fills your mouth with incredibly crisp, clean flavour. Designed to be vaped all day long, this deliciously pure blend offers the perfect balance of sweetness and flavour intensity. eVo Spearmint E Liquid High VG blend Breath mints have met their match. Spearmint — a refreshing new e-liquid twist on an old favourite — fills your mouth with incredibly crisp, clean flavour. Designed to be vaped all day long, this deliciously pure blend offers the perfect balance of sweetness and flavour intensity.